“…I always have an inspirational message in my music, and I want music to change people, to move people and uplift people. On this record, I think I found a balance to not just say uplifting things, but make music that people can relate to. I feel like my songs are like my children, and ‘Only Love’ is like that precious baby that you have. The special thing is it doesn’t take any sides. I don’t want this to be a song that any side can use against the other to say, ‘this is what you should do’ or ‘this is how you should be,’ this is what we’re doing right and you’re doing wrong.’ This song is about what happens at the end of everything. At the end of the day, when all is said and done, all we really have is love for each other, and love will keep us and carry us. The love of God is the only thing that will keep us and carry us…” Revealing to the world just how popular his music really is, where he became the best-selling artist in the history of The Voice, and also the season 9 winner of The Voice in 2015; 24 year old singer/songwriter Jordan Smith unveiled his debut album Something Beautiful in 2016, full of covers and a few original songs thrown in as well. You can read our review of the album here, yet the time has come now for us to sink our teeth (more like our ears) into Only Love, the sophomore album from Jordan that’s a bit…different if you want to call it that. Gone are the classical and opera style melodies and here is the pop, the jazz, the fancy, the hip and the relevant. Gone are the slew of covers and here are the honest and personal melodies that are relatable to a wide group of listeners. Does this make Only Love much more rounded than Something Beautiful? Or more inferior? Well, let me just say this- even if you’re not a fan of The Voice, can I just try to convince you to take a quick sneak peek of what Jordan has to offer, on this album as well as his previous record? Because vocally, he’s at the top of his game right now, and probably right now only third to both Bart Millard of MercyMe and Mark Hall of Casting Crowns in terms of vocal ability (in my opinion! )… anyway, just take a listen and see what you reckon. I know you definitely won’t be disappointed. An emotional and heartbreaking melody to open the tracklist, “Please” has Jordan passionately pleading with his loved one (with ‘pleases’ in order to persuade them) to stop cheating on him, in blunt terms; and is a heavy melody thematically to open up with, but one that needs to be sung about, as we grapple with the concept of staying true to your partner especially in times of trouble. going hand in hand with “Covenant” from Tenth Avenue North, “Please” encourages us to take a look at our issues, and air them out with our family, our spouses, our girl/boyfriends, because it is only then when we’re honest that we can truly be in real relationships. “Love Her Better” is next, and though seemingly pop on the surface, and musically is a joy to dance to, this track is lyrically anything but light- as we are confronted with the reality that our life can pass us by when we’re indecisive and take a step back in any circumstance. Using the analogy of someone being jealous that his almost-girlfriend has now found someone else that isn’t him, and lamenting on the fact that he didn’t pursue her hard enough before; we are met with a revealing melody that asks us why don’t we take charge and go after the things we want? What do we have to lose? The rest of the album continues on this vein of asking questions that we don’t necessarily know the answers to, and that’s ok. “Box” is the next step on Jordan’s journey of asking questions and is a standout on the album personally. Pop through and through, we are met with a melody that reiterates that we as individuals are unique and we don’t need to be anyone other than ourselves. We don’t need to be perfect, we can just like as God fashioned us and shaped us to be without any worries that people would judge us. And that’s the beauty of a song like “Box”, as it can break chains and revolutionise the music industry. Perhaps this song could be a single in the future? Next up is my all-time favourite of the album, and that’s the title track and the album’s official first single. “Only Love” probes and probes, and with the honest and emotional track led by the piano and led by Jordan’s inspiring and powerful vocals, we are met with a larger-than-life track that emphatically reminds us that ‘…only love, can look inside a human heart, and see us for who we are, and we are would be enough, if only there was only love…’, and encourages us to find that love for ourselves, with is inferred to be Jesus especially once we know that Jordan is a firm believer and his faith shapes everything he does. “Only Love” would be THE SONG I’d encourage you all to listen to first, but that’s not to say that the other tracks aren’t compelling nor challenging nor resonating at all. Case in point is “Lonely Eyes”, a groovy jazz infused pop melody where Jordan calls out fakers and people acting like everything’s fine, saying that we can lie all we want to but nothing can hide the subconscious emotions on our faces; and “Nothing On You”, a sweet, warm and heartfelt piano led ballad, where Jordan sings a song of encouragement and thanks to his wife, relaying that she is far above any of his exes in every way possible. “End In Love”, a cover of a John Legend melody, is quite possibly one of the most inspiring ‘mainstream’ relationship style melodies I’ve heard in a long time, as Jordan relays to the audience and an unspecified girl that he’s willing to do the work to make the early relationship end up in love for both of them- which is obviously a song about how he and his now wife fell in love and married. A track that we all can declare to our potential spouses, “End In Love” promises that there’s no easy road to happiness, and that fulfilment most of the time arises once we put in the work- a scary notion but a necessary one that we need to hear. On the flipside, the piano led “Find Yourself In Me” is as sad as they come, and is about the persona asking his soon to be ex why she can’t find herself in that relationship, why she needs to run away and upend their whole history- and if that’s not heartbreaking, then let me tell you that when I was listening to the song, I could imagine God singing parts of that to us, asking us why have we decided that He’s not needed, that we can do life on our own. It’s a melody with a double meaning, yet Jordan’s emotion and passion here make this song real and authentic, and not preachy at all- definitely one to listen to as we remember that identity isn’t in the things of this world but in Jesus alone. “Burn It All Down” follows, and is somewhat of a metaphor, and a song in my mind that’s sung to the devil, telling him that everything weighing down on us will be burned to the ground (might be literally, but definitely metaphorically) as we enter into a new start without any baggage; while the acoustic guitar and keys led slow ballad “Beauty Lies” challenges us to be more vulnerable with our loved ones, even if it’s messy, because ‘…when you lay down your cry, that’s where the beauty lies…’. The album then takes a turn for the time travel throwbacks as I swear we’re literally listening to a track from the 50’s and 60’s in the big booming jazz inspired “Feel Good”, where Jordan emphatically reiterates that we all need to feel good. Not really giving the reason why- I guess we’re meant to believe that’s we can feel good because of Jesus, especially when there’s a gospel choir and a real ‘Christian’ atmosphere to the melody, and it is these layers that really make the album as a whole all the more enjoyable and necessary to listen to. The album then ends with the quasi-worship song “Sleeve”, another personal highlight; as Jordan ardently declares that no matter where he is in the world, Jesus will always be with him, and he won’t forget the fact the Jesus is the One who He should be putting all the focus onto, that ‘…Your words are my armor my strength, Your love is my one saving grace, no demons nor doubts can bring these walls down, as long as You’re here with me…’. Emotional, raw, vulnerable and brutally honest, this is worship at its most simplest- kudos to Jordan for revealing a part of himself that probably wasn’t seen before until this year. “…The first album happened in that whirlwind that I was riding at that moment. It was like, get it done, get it out. Do whatever is necessary to make this thing in time. With this one, it was really important for me to step away and really define who I was as an artist, as a songwriter, as a musician, because I don’t really feel like I’ve had a chance to do that, yet. For me, it’s really important to figure out what’s floating around inside of me — what sort of music that is, what lyrics those are, and get that down on paper and really make this about me, and make this something that defines me, and take a little time to do that…” Usually soon after an artist wins a certain singing competition, like American or Australian Idol, or Australia, America or Britain’s Got Talent, or the X Factor; the winner’s debut album releases shortly afterwards, most of the time comprised of only one or two originals and the rest of the album are renditions of other artists’ songs. 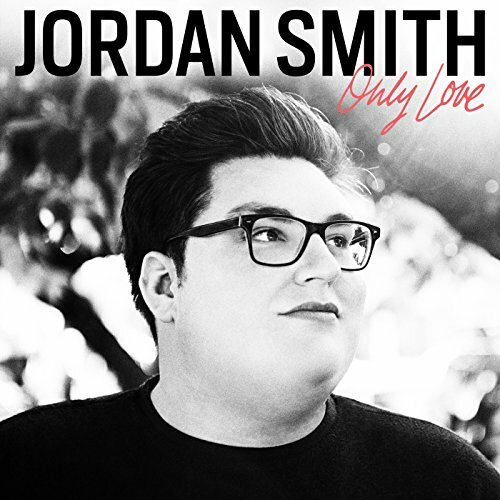 This is more or less the case with Jordan Smith’s debut album, with only 4 out of the 12 songs originally recorded by him. Only Love is different in that it’s almost all originals, and as Jordan conveys amongst quite a few topics that there are things in this world to look forward to, to hope towards; we are ultimately blessed to hear an album like no other, and a release that is sure to be on our playlists on Spotify or on iTunes or wherever else, for days, months, years to come. Therefore, what I can say about the album in one sentence to sum up, is that Jordan has delivered a true masterpiece that deserves to be listened to again and again. From inspiring melodies like “Sleeve”, “Only Love” and “Box” to danceable toe tappers like “Feel Good”, “Lonely Eyes” and “Love Her Better”, one thing I reckon is certain once again like in his debut. That in whatever sphere of influence Jordan is placed in, God will ensure that he succeeds. Well done Jordan for a compelling and motivational follow-up to Something Beautiful. For those who have not heard this album- that needs to change now! No more needs to be said!